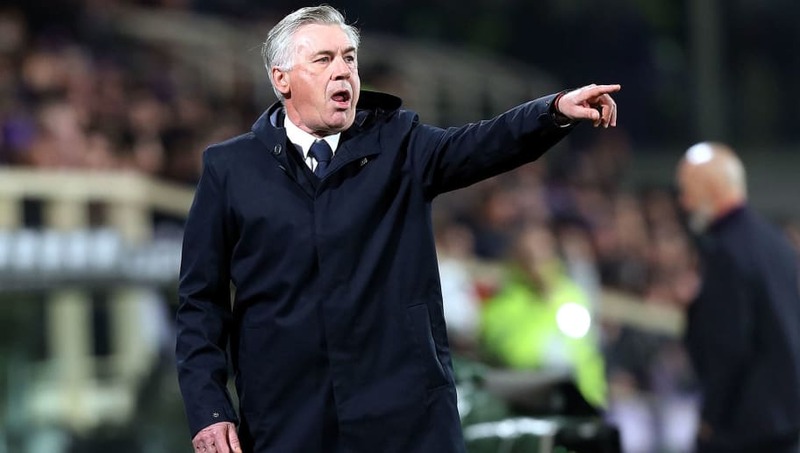 Carlo Ancelotti was disappointed with ​Napoli's 0-0 draw against Fiorentina on Saturday, after ​Gli Azzurri failed to score in their third Serie A game away in a row​. With ​Juventus pulling away in the title race, Napoli can't afford to drop any points if they have any hopes of catching the Turin outfit. However, a draw against ninth place Fiorentina is exactly the result Ancelotti and the Neapolitans needed to avoid if they are to challenge Juventus for the scudetto. Speaking to exclusively to ​​Sky Sports Italia after the match, Ancelotti said: "We dropped two points that we would’ve deserved for attacking from start to finish. "In some ways, it was an impeccable performance, but we weren’t clinical enough in front of goal and were forced to make do with a point. “It’s true we had a little more difficulty building from the back, as Fiorentina were pressing us high, but once we got past that, we did more than enough to deserve a victory. “In the first half, we were giving Alex Meret too many back-passes that were difficult to handle, but we found a way out and then took control with numerous clear-cut scoring opportunities. We’ve just got to work on our finishing and keeping a cool head when clear on goal." Belgium striker Dries Mertens came the closest to breaking the deadlock for ​Napoli, with two shots at point blank range both saved by young Fiorentina keeper Alban Lafont. “Mertens is unlucky at the moment, as he created the chances with his movement, then lacked some sharpness in front of goal. Lafont deserves a lot of credit too for several excellent saves, including the one on Piotr Zielinski"
Although the draw has second place Napoli only eight points below league leaders ​Juventus, the Old Lady is travelling to 11th place Sassuolo on Sunday and could extend the gap to 11 points, but Ancelotti is not worried about Napoli's chances after dropping points. Finally, Ancelotti was asked to comment about the futures of Marek Hamsik, who is still waiting for his move to Chinese club Dalian Yifang, and the injured Raul Albiol.